This the best place and where you can make your own stamps online and they are great gifts for people who have everything. Choose the Horizontal or Vertical Photo Postage Stamps available in Small, Medium and Large stamp sizes. With several different stamps VALUES for postcards, greeting and many more. Personally, I like the Medium and Large Personalized Postage Stamps the best because of how the pictures fit so nicely. Try each size with your photos to see your favorite. Great idea with your own Personalized Postage Stamps USPS with INSTRUCTIONS. Christmas stamps with photos. Great Gift Idea for Grandparents who have Everything, Parents, New Parents, Friends and Family. My mom asked me to create these Personalized Picture Stamps because she doesn’t need anymore stuff around the house. She doesn’t want to make anyone feel bad, so she doesn’t tell my brothers not to buy her any more stuff. I wondered if people would indeed buy personalized photo stamps as a gift or not. Well I found out people love these stamps, not only as gifts, but for their own use too. They have quickly become one of my top sellers. Thank you mom for your brilliant ideas and thank you to my customers who are purchasing our personalized postage photo stamps. EASY Visual and written INSTRUCTIONS are below or CALL me, Linda to HELP 239-949-9090. Make the most awesome Custom Postage Stamps USPS, Official United States Postal Service. When you want your photos to look their best for new baby announcements, family Christmas Stamps, cute pet stamps or whatever you wish to give as a gift or use them for yourself, Zazzle is the best. Amazing Robotic Printer Machines by Zazzle are “SECOND to NONE” with the Bright Vibrant Printed Gifts that are so detailed, you can see small tiny print. Zazzle offers a 100% Guaranteed with Less than 1% of Gifts are ever Returned. Vertical and Horizontal orientation photo stamps in Small, Medium and Large Sizes. 12 Different Postal Rates including Postcard all the way to Priority Stamps. Zazzle keeps ALL Postage current. If you see old rates, click on the photo postage stamps and you will see the current rate. Stamps with pictures on them and some of the personalized photo stamps have text box templates that you can delete the temporary text and type in your personalized text, but you didn’t know where to buy them online. Zazzle is the place. They come in sheets of 20 stamps per sheet. 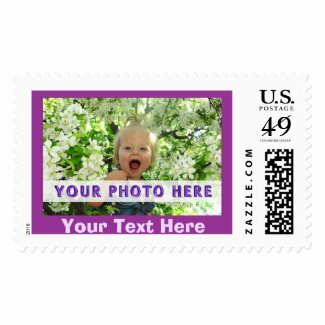 Incredible and detailed custom printed stamps makes Zazzle the Best place to buy personalized stamps. Add photos of your grandchildren, kids, new baby, your puppy or special dog. How about showing off your artwork. Everyone will love these Personalized Postage Stamps USPS with INSTRUCTIONS. Zazzle Designer Little Linda Pinda offers FREE custom designing service on hundreds of Zazzle Postage Stamps, Personalized Party Supplies and Decorations and gifts. CALL Linda at: 239-949-9090 for your Free No Obligation Custom Design Service. 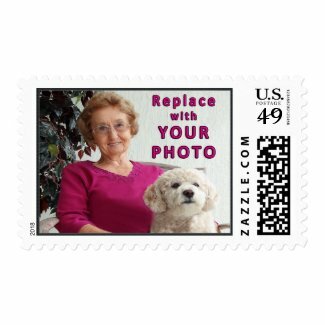 Everyone will love seeing your photos when they receive the really special letter or post cards Personalized Postage Stamps USPS with INSTRUCTIONS. Choose your denomination for several stamps. You can also Delete the text completely to only show stamp photo. Stamps with or without Text Box Template for Your Particular Text. Smiles will abound when your friends and family see your Christmas Cards or special letters or invitations adorned with these precious Photo Stamps for Weddings, Showers, Anniversary, Save the Date, Baby Announcements and so much more. Just imagine the faces of delight your friends and family will have when they see these adorable and memorable picture stamps that are official postage stamps. Official Photo Postage Stamps USPS. When Stamp Prices Change, Zazzle Sells only the CURRENT United States Postage Stamps Value. When you click on any of these Postage Stamps, the most current and up to date Personalized Postage Stamps “USPS” will come up. Show off your new baby, your family, wedding stamps and more. Available in ALL the Current United States Postage Stamp Value. Great gift idea for the Inlaws who have everything or grandmothers and new moms. An accountant recently called me. He told me he wanted to buy a bunch of these stamps for his wife to celebrate their brand new baby. What a wonderful gift for new mothers and fathers. She is going to love sending out birth announcements and special letters to her friends and family with their new baby’s photo postage stamps. Family can watch the baby grow on these personalized postage stamps, it is official and will change as the rate changes. A+ Rating from the BBB.org (Better Business Bureau) 100% LOVE IT Guaranteed and Less than One Percent of products Returned. Amazing. Putting these personal mailing stamps on your special letters to friends and family will be so much fun. They will smile when they receive your extra special letter. Zazzle has stood the test of time all over the world. Great idea for Christmas stamps with photos. CLICK on the Images of the Stamps and Gifts to Go Right to the Product on Zazzle to see the prices, quantity discounts, sizes and other details. All of these photos are of different members of my family. There is my Mom and Billie. My mom is the reason I create personalized postage stamps. She absolutely insisted that I make them for Gifts for Grandparents who have everything. She really appreciates the thought of many of the gifts we give her but she just doesn’t have the room for so many different things. Then we started giving them restaurant gift certificates which she really enjoyed but now that she is without my dad, she doesn’t go out to eat as much. Picture Stamps are the perfect Gifts for Grandparents who have everything. Many people save the envelopes too, just to keep reminders of special occasions in their life. Have it Personalized Postage Stamps USPS. My mom loves these photo postage stamps because they are fun and useful. Think of the joy your parents and grandparents will have putting these stamps on special letters and cards for their friends and family to enjoy seeing their grandchildren or to show off the newest baby. Everyone will thoroughly enjoy receiving these as gifts. These postage stamps with your own picture are sure to be a big hit even for the hardest person to buy for and you could make them even more wonderful to receive by saying, “I LOVE YOU”. See the Rate Chart for Stamp Current United States Postage Stamp Value RATE availability. You can buy sheets of these stamps from Personalized Post Card Stamps up to the Priority Rate of $5.60. Currently Postcard Rate is 34 Cents. First Class Stamps are 49 cents. Choose Horizontal or Vertical Orientation and Select the Rate in the Drop Down Boxes below the “Personalize it” area which can be found to your right of the Photo Postage Stamps USPS. Be sure that you have permission to use any photographs or images. SELECT YOUR POSTAGE RATE PRICE in the Drop Down Box “Choose Your Rate” located below the “Personalize it” area to the right of the Photo Postage Stamps USPS. Click the “Orientation” Drop Down Box to Choose Horizontal or Vertical Orientation Personalized Stamps. (Zazzle will UPDATE all Postage Rates immediately when USPS raises their rates). Rates as of 2015. Try to use a Picture that is the approximate PROPORTION of a 6 inch x 4 inch Image. It doesn’t need to be that size, just close to the same shape of the Vertical or Horizontal Pictures. ADD YOUR PHOTO by Clicking on the tiny blue “Change” located under the Temporary Photo. CLICK the Blue Button “Upload New Images” and then CLICK the White Button “Select 1 Image to Upload”</b> Choose YOUR FAVORITE PHOTO from your computer file. Highlight the Temporary Text within the Text Box Templates. Type in YOUR TEXT or DELETE it altogether. Note from Little Linda Pinda: Read how I almost got Scammed by International Hackers and How to Help Prevent it from happening to you. Always check the URL Web Site Address Box to be sure you are visiting the official site of your choice. I Googled my Internet Carrier asking for their telephone. An International Scam Company put their own USA Telephone Number in the search results. I was very tired and didn’t think to check out the URL in the address bar before I called. I was put directly in contact with the SCAMMERS and fortunately, a still small voice inside of me, told me I was in-touch with Internet Scammers and not my Internet company. I felt the Lord really protected me on this call because they could have had total access to my computer but for by the grace of God, they couldn’t get in because of Internet problems I was experiencing. BEWARE, Check the URL yourself in the actual address bar. Anyone can take screen shots (as I did with this Postal Service Calculator page) and they can Link it directly to a Scam Site. 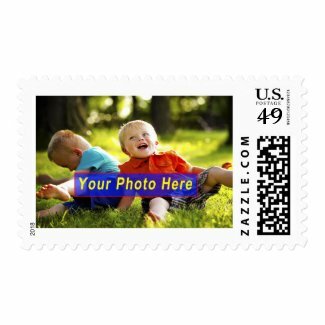 Personalized Postage Stamps USPS are Great Gifts for New Grandmothers, New Parents, Gift Ideas for InLaws Who Have Everything and anyone who will be so proud to show off their favorite pictures. Christmas stamps with photos. Gramma will think these Personalized Postage Stamps USPS are fantastic!!! New Parents and Grandparents will also love these personalized postage stamps gifts because it is practical and they will love using them and showing off their new baby and kids. They will smile every time they send a letter off to their friends or family. Imagine the look on their friends faces when they receive this special letter. But you sure don’t want to waste your special personalized stamps by paying your bills with them. Keep them for those special announcements and letters. Personalized Postage Stamps truly are great gifts for people who have everything because they are special and practical. Everyone loves showing off their family to their friends. Make these extra special Christmas Gifts for those who have everything because they don’t have these. Call me, Linda, to help you upload your photos. I will crop them for you and even do some brightening up of your precious photos. I offer this service free to my Zazzle customers as an appreciation to you for helping my design business grow. Thank you so much. Please save my telephone number and web site for future requests. I recently found some interesting Links and Videos for New Photographers. It’s a camera that you can grow into as you learn photography tips. Photography tutorials for beginners on website in print and video tutorials. Please Visit my Zazzle Store with lots more Personalized Postage Stamps USPS, Unique Sports Gifts and Lots and Lots of Pretty, Cool, Rustic and really different personalization gifts for the whole family. Thank you so much for choosing to shop with Little Linda Pinda. I am working very hard to bring you unique Custom and Personalizable Gifts that will thrill your friends and family like it has for mine. Please call me for any changes to my designs or if you would like a design you liked on a different Zazzle Product. Custom changes and requests are no extra charge. I am a designer who creates the designs and Zazzle has an amazing robotic printing machine. Zazzle is a Print on Demand Company. They will Print my design with Your Customization and fulfill your order. Many gifts ship out within 24 hours to a few days. Please read the shipping information for EACH GIFT. Some specialty products take longer. Check out Zazzle’s A+ Better Business Bureau Rating by clicking the BBB icon above or just Google Zazzle BBB and it will be in the first results. My family and I have purchased many products from Zazzle. The printing is so crisp and clear. Every detail that I design will show up. Even the grains in sand showed up. Please BOOKMARK my site because you might think of something you would like for yourself or to buy as a gift. I actually took videos of my family opening up some of their Zazzle gifts. See my Zazzle Reviews too. Remember, I can usually photo shop adjustments on your images for the perfect fit. Sometimes I brighten them up or crop them, etc. I don’t charge any extra. 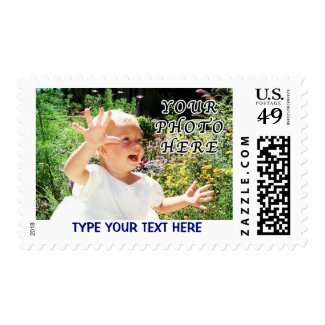 Zazzle Postage Stamps are the best, most vibrant and amazing Personalized Stamps you will find. I am thrilled with the Zazzle gifts that I’ve given and bought for myself. Here is the Link to See All of the Categories for my Personalized Sports Gifts. They have been a big hit so I spend a lot of my designing time creating Cool Sports Gifts. Personalized Sports Gift Ideas for Coaches, Cheap Team Gifts, Gifts for Players with their NAME and Jersey NUMBER, Team Name etc. Customizable with Your TEXT and PHOTOS. Calling is the Fastest and Surest way to contact me. Custom postage stamps best price for the highest quality printing available. They are not the super thin, low quality printing you may have experienced in the past. Zazzle’s amazing Printing Robots are “Second to None”. If you are not completely satisfied and don’t LOVE your stamps, you can get your money back with no questions asked. Once you experience Zazzle, you will love having such a great place to shop. I buy many gifts for my family and friends from Zazzle. I really appreciate and want to Thank you very much for shopping for your Personalized Postage Stamps USPS with Little Linda Pinda. Please CALL or TEXT if you would like me to create something special for you. Personalized Postage Stamps USPS make perfect gifts for people who have everything because they are special, personalizable gifts made just for them and very practical. They will love putting these stamps on special letters and cards and announcements. What a wonderful way to announce your new baby. Show off your puppy to your friends. Gift Ideas for Parents who have everything. It is so thoughtful to send postage stamps to new parents. It’ll make it not only easier for them to send out birth announcements to all of their friends. It’ll make their friends even feel special that you cared enough for them to send customized stamps. Use these Christmas stamps with photos, what a great idea. If perchance you’d like to send them a similar complementing announcement cards, I have those on my store site also. Zazzle makes amazingly clear and crisp Photo Stamps. Incredible Crystal Vibrant Printing. Choose the best robotic print on demand company. You will love it (or you can return it, with no questions asked). That’s one of the reasons I really like working as an independent designer with Zazzle. They always put the customer first. What is a Good Camera for a Beginner Photographer?